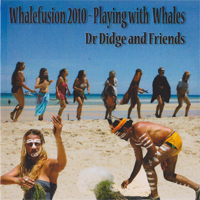 This album blends east coast Australian whalesong 2010 with 12 different keyed didgeridoos, vocal harmonies and digeridoo subsonics. I invite you deep into the realms of whalesong/didgeridoo conciousness. Ideal for use in meditation, session work, energy clearing, yoga, general healing or just easy listening. A special thank you to the majestic humpback whales for sharing their presence and song. In gratitude, Dr Didge Dolphin. This CD is an offering of our shared experience. Recorded live on 40ft catamarans during interaction with humpback whales; this music arises from our passion to be more connected with nature and to contribute to the healing of our planet. This is our 6th consecutive year recording and jamming with whales. Each year the whale song changes and in each moment out music fusion reflects our interaction. This music arises from our passion to be more in tune with nature. These songs were recorded live during interaction with humpback whales aboard a 40ft catamaran. Our heartfelt thanks to Tarshito for his ability to capture and weave the music and to the whales and musicians for sharing their song. Each year the whale song picks up where it left off, so each year our music will also progress. Enjoy this years offering of sound healing, ideal for session work. Bunna Lawrie sings through his ancient indigenous Mirning past accompanied by Dr Didge Arpana’s pulsing didgeridoo and the sound of eastcoast Australian humpback whalesong. This album is a tribute to these ancient creatures and we especially honor the appearance of Migaloo – the white humpback whale that does the annual migration from Antarctica to Northeast Australia. 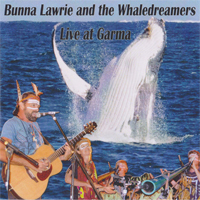 Led by Aboriginal Whaleman Bunna Lawrie (of Coloured Stone) The Whaledreamers are a contemporary expression of indigenous whale chants and upbeat positive songs. This album recorded live at Garma09 – Indigenous Festival of Yolgnu people North East ArnhemLand-Australia. Thanks to YothuYindi foundation for their vision to keep culture alive and the annual Garma festival. This is our 6th album in series of annual recording of humpback whales of the easy coast of Australia. Each year the song is different, with many whales offering the uplifting vibration of their song. This year again, we recorded after calving season with many mums and calves. We believe all humpbacks, like all humans can sing. We each have our own unique song to share. The more we connect and open to the authentic voice within, the sweeter the song we sing! Humpback whales are the ultimate singers, keeping the harmonic resonance of the oceans in balance. Thanks to the majestic humpback whales for sharing their presence and song. This CD is an offering of our shared experience. By opening to the vibrational essence of these songs we connect to the heart of creation, the wisdom of the whales and our magnificent beingness. May these songs inspire us on our journey to awaken the authentic voice within. with Alpheus herterochaelisThanks to the majestic humpback whales for sharing their presence and song. This CD is an offering of our shared experience. By opening to the vibrational essence of these songs we connect to the heart of creation, the wisdom of the whales and our magnificent beingness. May these songs inspire us on our journey to awaken the authentic voice within. 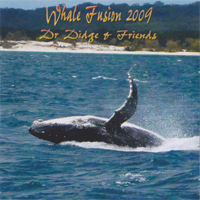 Recorded live off east coast of Australia in Oct 05. by Dr Didge Dolphin and friends. This recording comes out of a desire to stay current with the latest whalesong. It is my belief that the whales are literally singing up the ocean waters and play a vital role in keeping the harmonic balance on this planet. In sincere gratitude I offer you this years whalesong songline.